The Folsom Symphony invites you to attend our next concert, “Russian Power/Russian Passion,” on March 26 at the Three Stages theater in Folsom. The evening will bring to life the contrasting music of two past Russian regimes through the work of two revered composers who created their masterpieces under the influence of 19th-century czars and 20th-century dictators. Symphony Musical Director Michael Neumann has chosen two symphonies to illustrate the evening’s theme: “Symphony No. 5, Op. 47 in D minor” by Dmitri Shostakovich, who composed while living in fear for his life under dictator Josef Stalin; and “Scheherazade, Op. 35” by Nikolai Rimsky-Korsakov, a 19th-century aristocrat whose innovative works often celebrated Russian history and nationalism. Shostakovich, born in 1905, was the best-known composer of the Soviet era. He is believed to have become disillusioned at a young age with the Bolshevik regime after the 1917 revolution. Pressured to use his art to portray the triumph and optimism of Soviet life, Shostakovich created music that appeared benign but in fact often hid themes of protest within its notes. Shostakovich wrote his stirring “Symphony No. 5, Op. 47 in D minor” under threats of arrest after Soviet authorities denounced some of his earlier works. Although the symphony appeared to conform to Soviet ideals, the public, and later historians, perceived it as containing expressions of the suffering the composer had been subjected to by Stalin. Its inaugural performance in 1937 in Leningrad (now reverted to St. Petersburg) was hailed with an ovation lasting more than half an hour. Although some Soviet authorities were suspicious, Stalin was pleased with the symphony and Shostakovich was restored to favor. After Stalin’s death in 1955, the composer was able to exercise more freedom in his artistic expression until his own death in 1975. Rimsky-Korsakov, born in St. Petersburg in 1844, was a member of a major Russian composer school known as the Mighty Five, a group of innovative musicians who advocated the writing of symphonies and operas that strived to interpret folklore, history and other elements in celebration of Russian nationalism. The symphony, which also premiered in St. Petersburg, tells the tale of the bride of a sultan who murdered a succession of wives on their wedding nights. The latest sultana determined to save herself by spinning tales so magical her husband wanted to continue hearing them. After 1,001 nights, he fell in love with his bride and repudiated his bloody vow. The passionate violin solo that represents the bride is considered one of classical music’s loveliest melodies. “Russian Power/Russian Passion” will be performed March 26 at 7:30 p.m. at the new regional Three Stages Theater on the Folsom Lake College campus in Folsom. 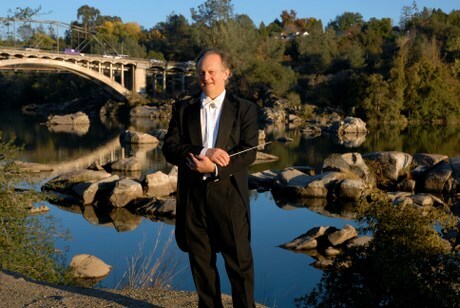 Now in its seventh season, the Folsom Symphony is the premier orchestra of the Folsom Lake region. With Maestro Neumann as its founding conductor, the symphony has been able to attract the highest quality musicians. Neumann has been the music director for the Sacramento Youth Symphony and Academy of Music since 1979 and is a popular guest conductor for several orchestras in California. Tickets for “Russian Power/Russian Passion” are still available. You can buy them through the symphony’s website, www.folsomsymphony.com, by emailing info@folsomsymphony.com or calling 916-357-6718. Prices range from $22 to $42. The Three Stages Theater is at 10 College Parkway in Folsom. Plan ahead: The symphony will close its 2010-2011 season with a patriot pops concert, “Land That I Love,” featuring beloved American tunes and composers on May 14 at Three Stages.